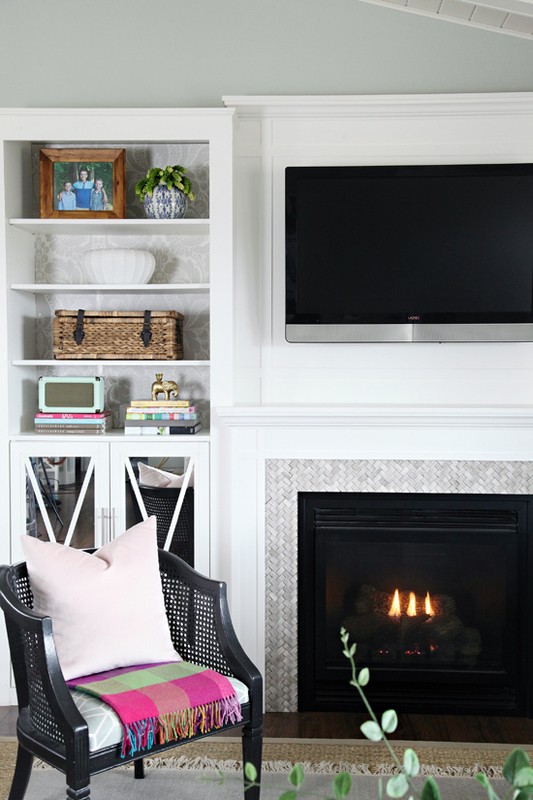 IHeart Organizing: A Living Room Update, Our New Sofa, and a GIVEAWAY! 774 A Living Room Update, Our New Sofa, and a GIVEAWAY! Our living room is looking a bit different these days, and that is because of a very beautiful new piece of furniture! And you know what? 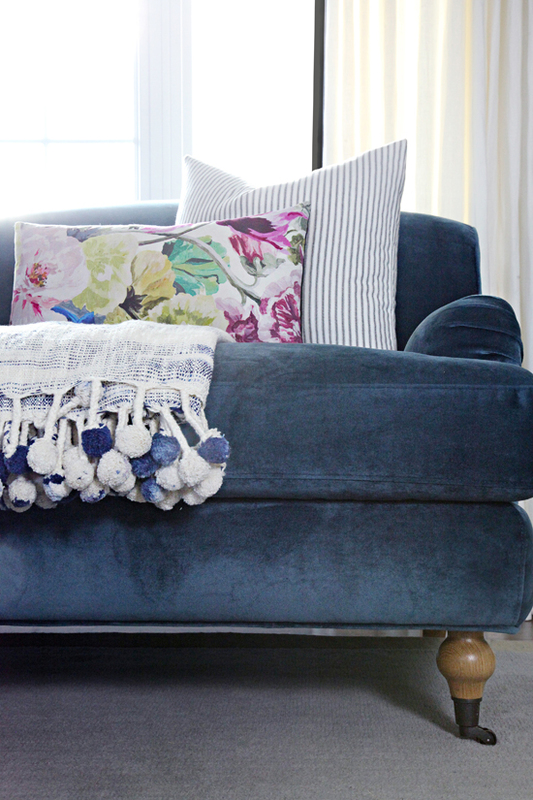 One of your spaces could have a new plush friend as well because today I am partnering with Interior Define to giveaway $1000 to use towards a chair or sofa, as well as a generous discount code just for iHeart Organizing readers! But before I dive right in, this story actually started quite some time ago. I will try to quickly summarize but there are definitely some key points I want to chit chat about. We all know I had some struggles when we tackled this space for the One Room Challenge almost two years ago now. 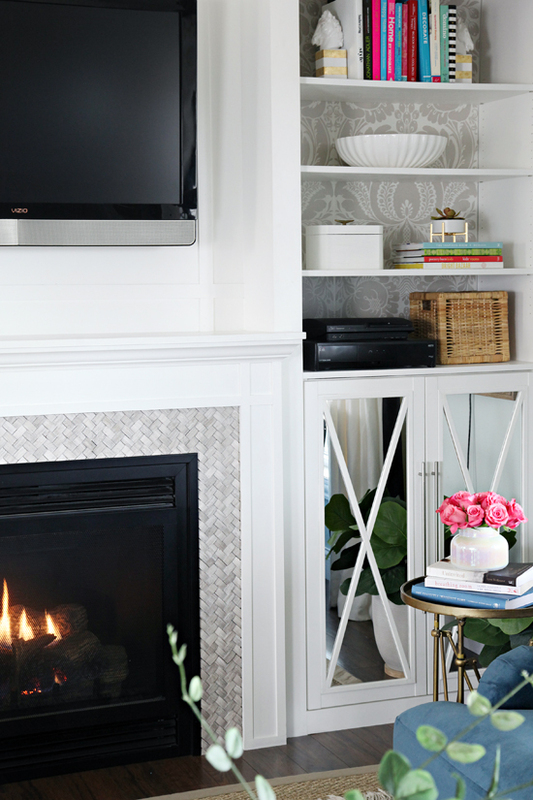 Removing a wall completely changes the way you can arrange and decorate a space. Walls are very good for arranging furniture and decorating but they can be very bad for good flow and use of space. I will tackle all of the pros and cons we have faced living with a new open concept space down the road, but the layout piece was definitely the most challenging aspect for me. 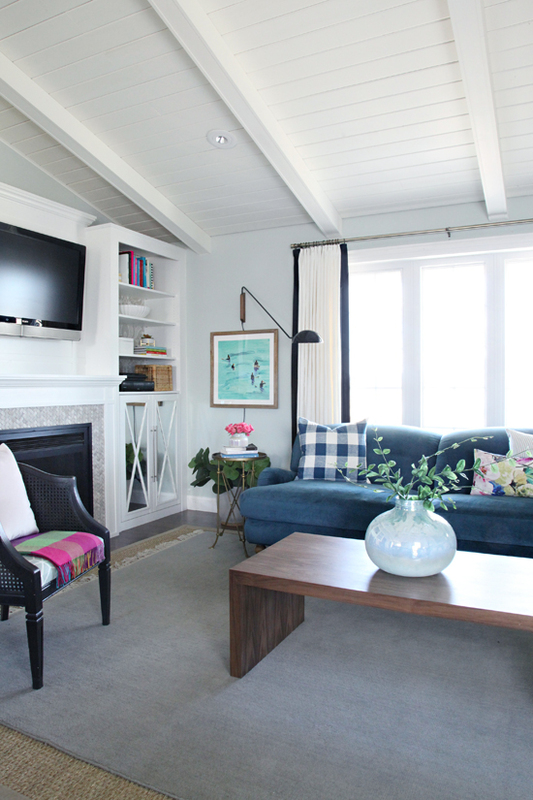 When we first set up our living room, we attempted to create two rooms in one; an entryway and a living room. Across the way are the kitchen and dining room. So really, that equals four rooms in one space, which can ultimately feel busy and really create challenges in terms of creating proper flow and balance. The two rooms in one also pushed our sofa forward, cut off the room and squashed down our total living area. After living with things for quite some time, we decided that it would be best for us to eliminate all of the extra entryway storage in order to gain a better balance and flow in our living room. The kids could easily keep their backpacks and school specific items in their bedrooms now, especially because they each have their own space and plenty of personalized storage. Of course, the goal was to make the most of the items we already had from our first go at the space so we moved a few of the pieces to my office and our lower level family room (which I will be showing more of soon). The remainder of the items were reused within the plans for the new layout above. So yay! A second sofa for our main living space! Bryan and I have found a pretty good formula for selecting a sofa we can both agree on; no pillow back, narrow arms, decorative legs, and comfort! A bonus feature we look for is a material that is easy to clean. We want people to feel welcome to sit on the furniture and the kids to feel comfortable lounging and reading and playing video games and watching movies. At the same time, I don't want to be stressed about fluffing cushions and straightening a sofa every time it is used (which is why no pillow back for us). I looked at sofas for quite some time and we really weighed out all of the options that fit our specific criteria. It also had to compliment the existing sofa, but we didn't want for it to be too matchy, matchy. 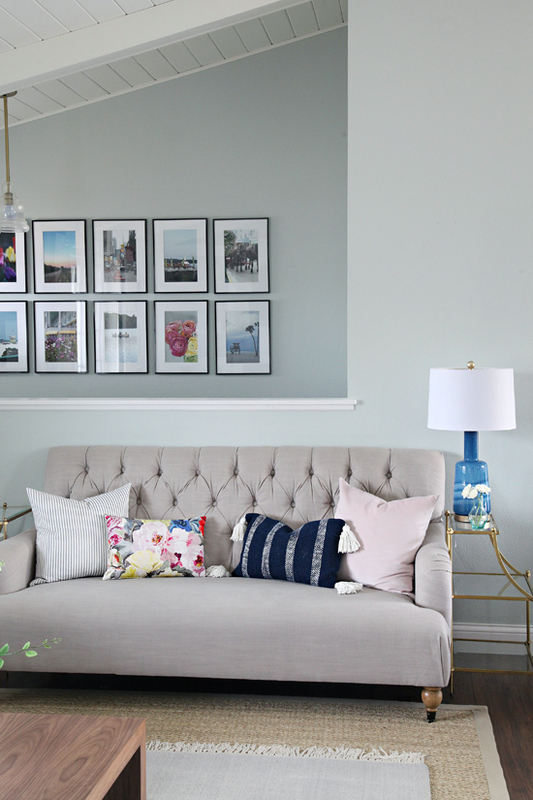 Quite a few of my friends in the blogging community had recommended Interior Define, and what really caught my attention was my love for the Rose sofa from The Everygirl collection. It fit all of our checkboxes and was also within our budget; almost half the price of similarly styled pieces we were also sourcing. Ordering a sofa online without having the opportunity to test it out first was the scariest part of the process. But I read enough reviews and even asked Interior Define about a couple concerns I had and ultimately decided I still wanted to pursue the option. I went to order a couple of swatches and was surprised to find over 40 choices to select from! And my favorite part was that every last swatch was available to preview in the specific sofa style we were interested in. That is so rare when furniture shopping online. So I ordered my first set of five swatches, and then I ordered some more. There were just so many options available that I loved and I really wanted to consider as many as possible prior to committing. We narrowed it down to five favorites... 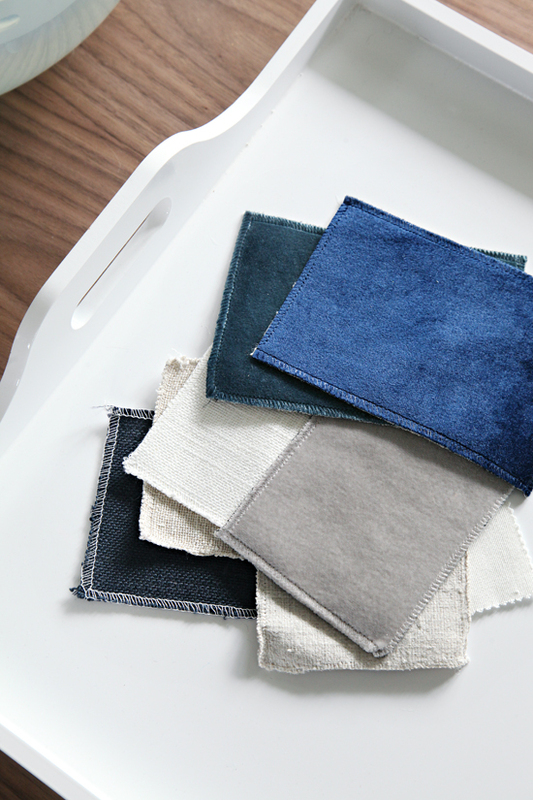 Heavy Cloth Ivory, Mod Velvet Greige, Mod Velvet Saphire, Mod Velvet Oxford Blue and Heavy Cloth Natural. Can you even? Each one is SO good and so pretty! Can I have one of each, please? I suddenly wanted to add three more living spaces onto our home and put a different colored sofa in each one. But since we could only pick one, we landed on the Rose style and the Mod Velvet fabric in Saphire. It was just so ridiculously soft and lux feeling that I couldn't stop dreaming of cozy afternoon naps and bedtime snuggles. I also did some spot tests on the swatch and everything came right out with a microfiber rag and water. This was especially important for two reasons; one is that our living room is open to our kitchen and food and messy fingers find their way to the sofa, and two is that I watch my baby nieces two days per week and their bottles drip and sippy cups leak and I just didn't want any worry of stains. I don't like to use chemical stain repellents so finding a fabric that is easy-to-clean on its own was such a huge bonus. 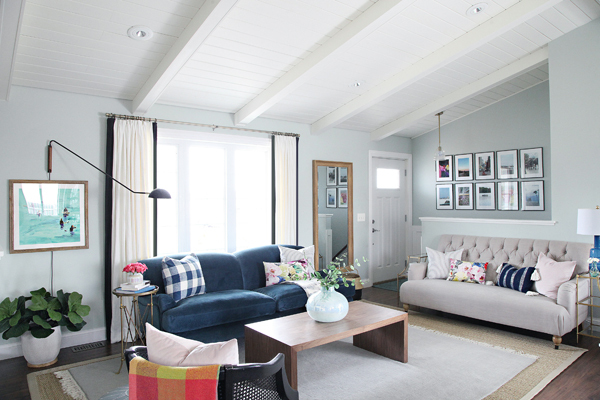 Of the three Mod Velvet choices at the top of our list, the Oxford Blue came off a bit too dark in our space, and the Greige was too close of a match to our rug and the other sofa. The Saphire was juuuuust right. The sofa was offered in a couple of different sizes, one which worked out perfect for our space. But another Interior Define bonus is that is if you love a sofa but need something sized specifically to your needs, they offer customer concierges over the phone or in person at their flagship Chicago showroom. Using a coupon code from a fellow blogger's website, I placed my order and waited not-so-patiently for our new sofa to be delivered. This is the hardest part of the entire process. It does take some time for the sofa to arrive because each one is custom made upon ordering. You select the sofa, the fabric, customize the legs and even the filling if you would like, and with that type of sofa purchasing experience comes some wait. But the good news for me is that while I waited, Interior Define reached out to me as a blogger to partner with! Why is that good? Besides the obvious reasons, they are not only great to work with but they are a company I had already selected on my own based on their offerings, service and the recommendation of my peers. And even better, they wanted to giveaway a very generous credit to one of YOU! This is a really wonderful way for me to be able to give back to all of you who have supported me and cheered me on over the years. I couldn't say no to that type of opportunity. It just made perfect sense. The sofa was delivered back in November and the best early Christmas present ever! Delivery was quick and professional; a full white glove service meant that the sofa was brought in, unpackaged and the legs were assembled by two kind men wearing gloves and booties over their shoes. We have slowly been making changes and updates to our living room as time and budget permit and when the right items come along. I really want this to be the last time we work on this room for many, many years. Time has been our best friend this round. So as I show the room today it is really fun to see how it has been evolving, but we still have a couple more items on our wish list to finish it off for good. The ottoman we DIY'd the night before the One Room Challenge photos were taken didn't last more than a few months before the fabric stretched and a leg snapped. So I quickly found an inexpensive table on Craigslist that has functioned really well in the meantime but will probably go back on Craigslist when we nail down our ideal partner to the stunning new sofa. You will also notice our cute little cane backed chair that was also found on Craigslist has received fabric that better compliments our wall color. I am surprised how often people go to sit in that specific spot, and the chair really doesn't offer much comfort for more than a couple minutes. A plush swivel option would be ideal but one day at time, right? 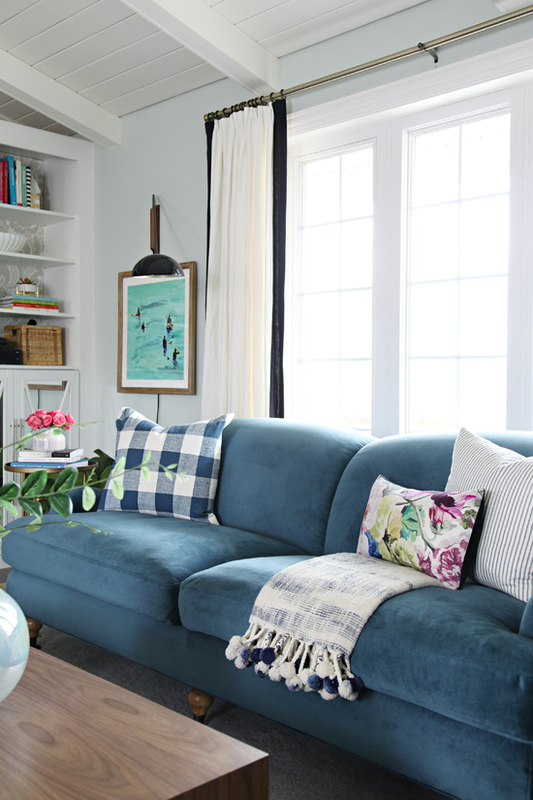 So although this post is truly about our love for our new sofa, it is also important for you all to see how it plays with the remainder of the space, with our flow and our colors and the new arrangement. We are over four months in with this baby and I am feeling really confident in our selection. 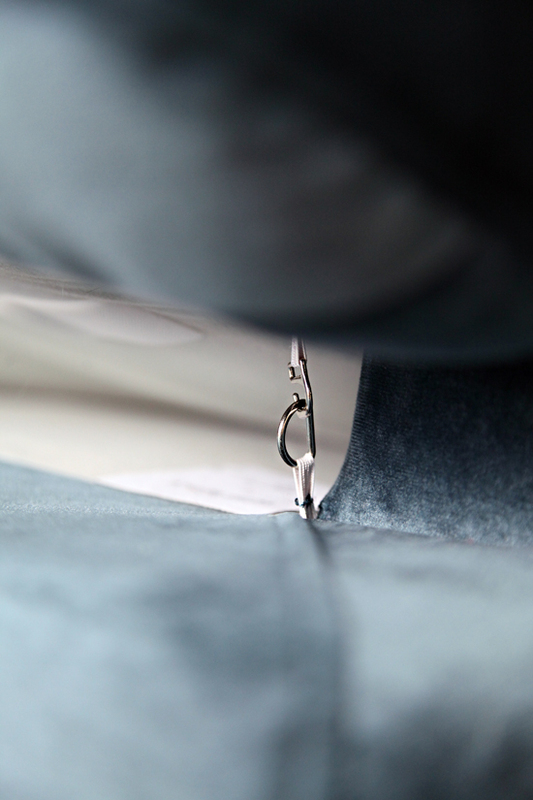 The fabric does, in fact, clean up beautifully. We have had spills and puppy hair and baby drool all come in contact with the cushions, but I wouldn't be able to point out any of those incidents today. The boys wrestle and have tickle fights, our nieces climb and nap, Bryan and I read, talk and watch movies, and there is no evidence of the daily abuse that it has endured. And it is even more comfortable than I could have dreamed. Two more favorite features include fabric that has little risk of pilling (our nearby sofa has been pilling quite a bit) and cushions that not only velcro down in place but also have clips to hold them to the back, sides, and front to prevent sagging and shifting. OK, more favorite details include the gorgeous rolled arms and caster adorned oak legs. Yes and yes! As well as the piping and down filled cushions and the vibrant color and.... OK, I will stop. But just for now. Above you can see how the room feels twice as big (because it sort of is), and also how our two sofas work together. We already had the gray rug from a couple of years ago, but to marry the two seating areas we layered an oversized seagrass rug below. 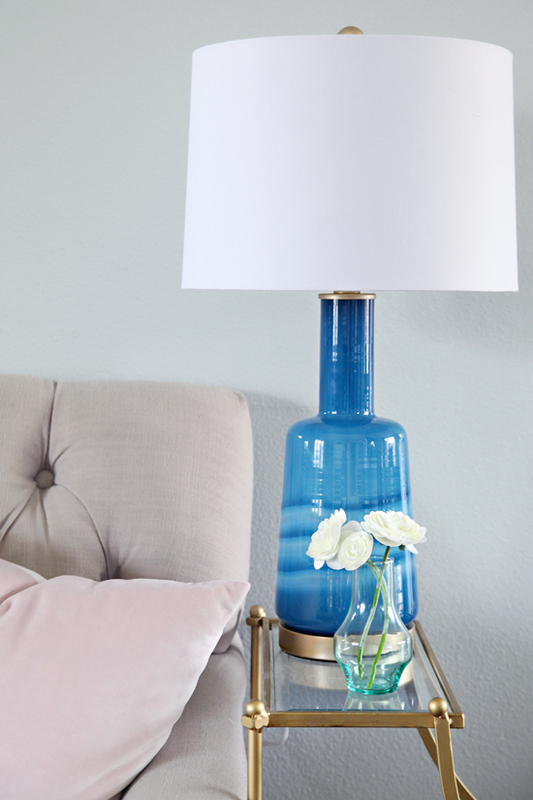 The lamp is a recent HomeGoods find and I have already purchased another one for the opposite gold swoop end table. We had one swoop table prior to our renovation and added a second to flank the smaller sofa. The second lamp balanced things out even more and I especially like how they tie back to the center of the room; the true focal point. I know the post is already getting lengthy, but before I sign off for today I am going to share a few more photos of the updated space as well as sources for some of the accessories we paired with the new blue beauty. I have a few favorite spots in our home where I like to take a few minutes to myself with a magazine, cozy throw, the fire, and a glass of wine, and this spot is currently winning the first place award. And now for the part you all have been waiting for! One of you lucky ducks will be winning a $1000 credit to use at Interior Define! That is $1000 to put towards one of their amazing and completely customizable chairs, loveseats, sofas or sectionals! IHeart Organizing readers will also receive $100 off of their Interior Define purchase with code IHEARTORG100 at checkout through 05/04/17! // Head to the Interior Define website, register your email address and leave a comment below letting me know what piece you would select if you win! // Giveaway winner will be randomly selected from the comment section. The winner will be emailed directly and will also be announced at the bottom of this post. Not sure where to begin? I shared some of my favorite pieces here! Best of luck everyone! This giveaway has ended. A supersized CONGRATULATIONS goes out to Tricia Weldy who was randomly selected as the winner of the $1000 Interior Define credit! Enjoy your new sectional Tricia! I would totally get the Maxwell Chaise sectional!!!! Beautiful! 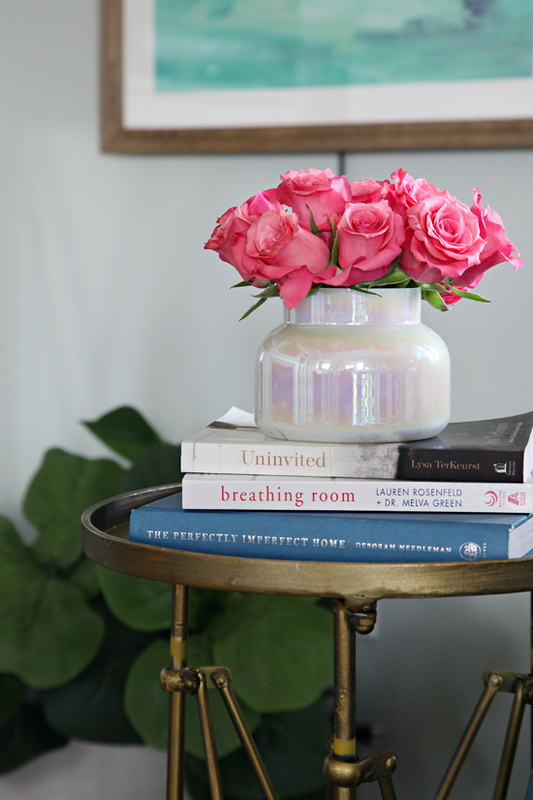 A supersized thank you to Interior Define for partnering with me on this post and for offering an amazing giveaway to iHeart Organizing readers! I would love a cozy reading chair for the master bedroom. Most definitely the Kelley chair! Just what we're missing to complete our first home together. Love the rose chair or apartment sofa! I'd go with either the Sloan Sleeper Sofa or Sloan Sofa with Right Chaise. Maybe winning would give me the motivational push I need to finish plans for my daughters' hangout space. We could use a sleeper sofa in the game room and I think the Sloan Sleeper in a fun blue or red would be perfect! I am loving the combo you picked, actually! We are anti pillow-back as well after three kids and the state of our current sofa. It never looks fluffed anymore. 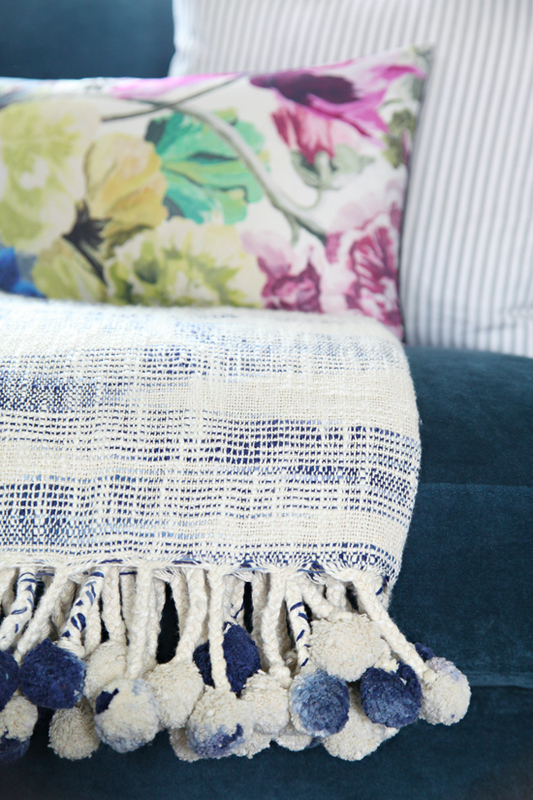 I have blue accents throughout my home and love hearing that spills wipe right up from the fabric. I really like the Maxwell and Caitlin chairs. How to choose??? The Sloan sofa for sure! Color/fabric tbd! I love the Rose sofa! I think it'd be perfect to replace my ugly sectional! Loved the Owens chair or the sofa!! The chair would be perfect for our living room! I'm so torn! My husband would probably love a comfortable accent chair in our room, but I love the new Ms. Chesterfield line! Our sectional has seen better days, so I would love to replace it with something fabulous. I love the Caitlin accent chair! I can see myself cozying up in it with a good book and a glass of wine. The Sloan sofa in Charcoal would be perfect in our living room! I would love to replace my sofa with a beautiful navy one. I love the Rose chair - so pretty! I like the look of the owens sofa! I'd love the Sloan sleeper to use in our guest room/office! I think the Maxwell would be perfect in our living room! Love the Rose or the Maxwell chairs! Would have a hard time picking a color from all of the beautiful choices but a gray or jewel tone would be gorgeous. The Caitlin chaise! Would be SUCH an upgrade!! I was just obsessing over the Ms. Chesterfield sectional a couple of weeks ago! I have a soft spot for Chesterfield sofas, even though they are not my usual style. This is such a great modern version! 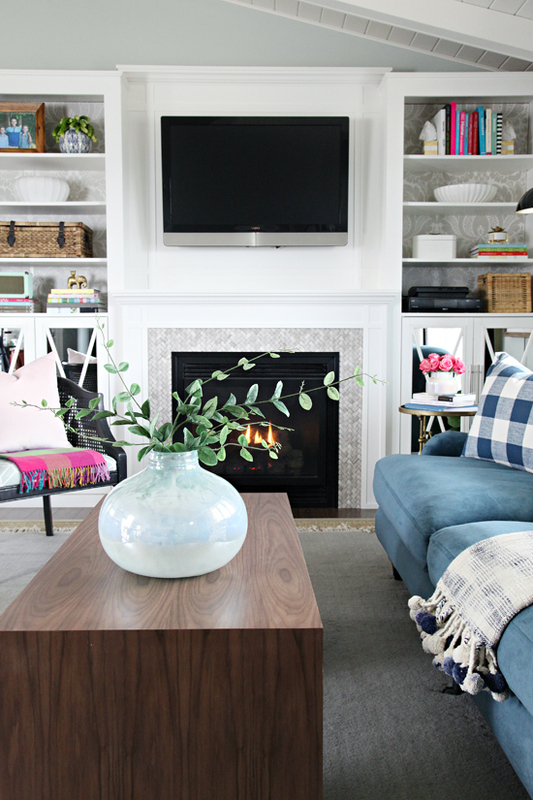 Thank you so much for showing us your living room updates! I didn't know about Interior Define, and I love their website!! It's so hard to choose what I would get if I won (everything is so lovely!!). I think I'd go for the sloan sleeper, which would be perfect for my office/guest room combo. I also love the Rose chair, which would fit nicely in my living room. I would love a cozy reading chair for my family room near the window! Jen, the room looks amazing!! 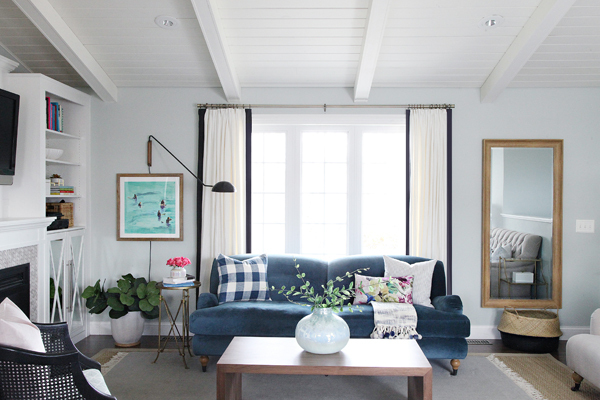 That blue sofa is perfection! And I have to say my favorite moment in the room right now is your corner of the sofa with the light and art hung right below it. The room is taking on a more casual vibe but still full of classic design and you've balanced the colors and neutrals so well - it's coming right along!! Thanks for the chance at an amazing giveaway too! I'm with you on the no-pillow backs, so the rose collection is fantastic but I'm also loving the Owens chaise. We're moving at the end of the year and selling all of our furniture and our next couch is an Interior Define sectional, no question. I really like the Ainsley sectional. Someday I'm going to put the Rose chair or sofa in my future office. I feel like I should get the Caitlin, since that's my name, but I'm really loving the Ms. Chesterfield and the Sloan Leather! It would be hard for me to choose! I love your choice! And I also like the Sloan sofa. I love the Rose sofa too! I love the colors and that the fabric is easy to clean! We just bought a office so I would be in heaven with this and get a new couch and accent chairs! I'm thinking a Caitlyn or a Maxwell chair to create a cozy living room reading corner. I'm not positive, but I really like the look of the slipcovered Maxwell sofa! I LOVE the sapphire color you chose. Perfect! And the room looks much more "user friendly" bumped out like you've done. Love it! I love the Kelley chair in Arctic! Love Love Love the Owens accent chair or Sloan apartment sofa! And the matching ottomans! Perfect for my husband's new home office. Thanks! 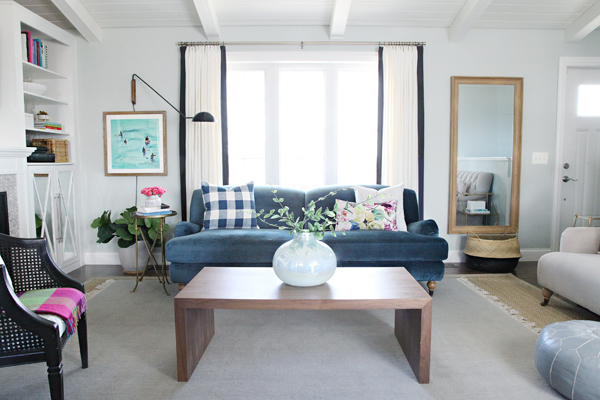 I am loving the Sloan corner sectional! The Maxwell chair looks soooo comfy and would complement my current sofa set beautifully! I would really love a new sectional for our upstairs loft and I think the Caitlin sectional would be perfect! Tough choice but I'm loving the Kelley sleeper sofa! We just bought a house, and are in desperate need of the perfect chair for our living room, so I'd go with the maxwell! I would love the Miles Sleeper! Sadly all the sofas I like have down in them, which I'm allergic to. I love the Ms. Westerfield sofa! My fiance are moving to a new home soon and have slowwwwly started the search for a sofa! I need a new sofa. We bought one a few years ago that already looks horrible and is falling apart. I'm leaning towards Sloan or Gray. We have been intensely shopping for a sofa online these past two weeks and then your post popped up in my feed today. Perfect timing, I hadn't heard of interior define before. I love several of their sofas. I would be hard pressed to choose between the Owens, the Caitlin, or the Rose and I saw several fabrics that I just loved. I am loving what you selected...definitely a sofa if I win! Thank you for this opportunity. I would pick the Caitlin chair, swoon! What a nice update to your room! I think I'd choose the Kaitlynn, but there are so many good options it's hard to choose! I would love a Caitlin sectional in our awkward living room. The current sofa doesn't hold much more than the dog and I! i need a new chair for my study which i am redoing and have picked out the perfect one - The Rose - and it would be wonderful in the sapphire color of your sofa!! thanks for finding this great source for furniture online! What a wonderful giveaway! Love the Rose sofas! I LOVE the Owens chair! After moving to an apartment, I find anything I have challenging to fit the living room, so I love seeing the apartment sofas. I think the Miles is my favorite style so far, but it's hard to choose. I love the fabric you chose! Not sure I could get my husband on board with the velvet. So torn between the Caitlin and and Walters, both are gorgeous! I love the update! I would have a hard time choosing between the Henry and the Gray! I love the Maxwell accent chair! I've had my eye on the Rose sofa for awhile. It's great to read your review. I'd love to have my own! Thanks!! An accent Chair, maybe the club swivel! I love the Ms. Chesterfield and the Maxwell! Both are just gorg! Love the new updates and your couch! I'm not sure if I would choose the Caitlin or Rose chair. The Caitlin chairs are to die for!!!! I would choose the caitlin sofa! i love the sloan apartment sofa! I'd love the Caitlin Accent Chair! Or maybe the sectional! This is so great! We have been talking about getting a new sofa for awhile now, I would pick the Sloan sofa. the Caitlin is beautiful! But the Jasper sectional is amazing too! Going to check them out now, I have been looking for a new sofa for almost a year...a year! I've been on the hunt for an accent chair and the Caitlin chair would be perfect in my living room! Love your Rose sofa, but for me it would be Ms. Chesterfield - 100%! I like the Kelley Accent Chair. Would be perfect for our living room. Love the rose sofa and the chair! love them all!! The Caitlin chair in Arctic would look amazing in my family room!! I would select the same sofa you did but with a chaise. Like you, I can't stand our current, pillow-backed sofa. I'm ready to trade it in for a more streamlined option. Love the changes! I really like the doubled-up rugs, too. Good move on the adjustments! Love the Caitlin chair. Been looking for something just like this for a while now! chesterfield or catilyn. i need something in my bedroom. I would love to get a accent chair for my living room. I have previously purchased accent chairs with patterns and I ultimately grow tired of the patterns. The Miles or Sloan sleeper! Thanks for the amazing giveaway, and for sharing your thoughts on buying a couch online. I would probably go with either the Maxwell or the Rose! The Sloan sleeper is exactly what we've been looking for to replace the current seating in our apt. living room! I'm totally in the market for a sectional right now! I'm very into the Caitlin. I love the Rose sofa also! It's so hard to find a nice sofa without separate pillows (that always end up sagging so quickly!). Woohoo!! Definitely the maxwell chair--love that it's oversized!! The rose accent chair is gorgeous! I love the Sloan Sleeper Sofa! Would be perfect for our sun room and to accommodate family when they visit! Definitely the Rose! And in sapphire blue!! It is just gorgeous! I LOVE the Maxwell! I'd get it in a neutral color. I've read many good things about Interior Define so it is awesome you are partnering with them and that you love their products! I would love a sofa exactly like yours for my master bedroom! 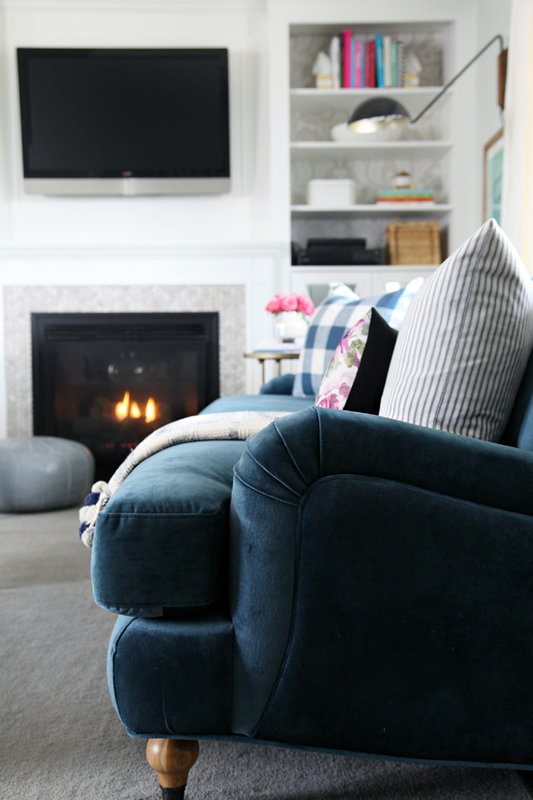 I'd love the sectional--but with my smaller place I'd also love a love seat in a velveteen! Nomz. Torn between the miles sleeper or ms chesterfield, both so classic and perfect for our new house! I love the maxwell and rose chairs. We just knocked out a wall between our kitchen and living room and are also realizing we may need to buy additional furniture. Thanks! I think I like the "gray" - its modern and I love that you can get the lowered arms on it! I would go with the Rose chair for our den - love your new sofa! This is an amazing offer! And an amazing looking company. I have never been able to afford a new sofa before but have been looking and pricing and trying to understand how to buy one that will last and last and work in most spaces. I am absolutely in love with the Maxwell! It looks like the perfect place to kick back and read a good book! 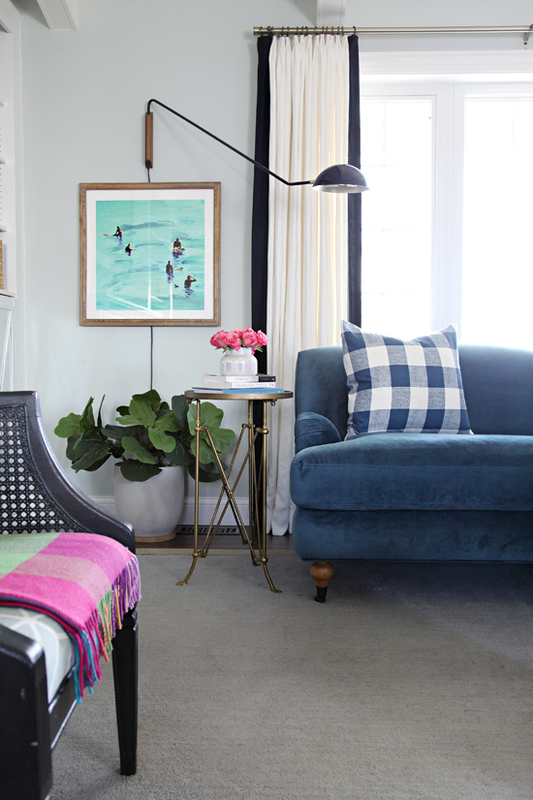 I have a serious crush on the Maxwell accent chair in narwhal mod velvet. Love the Maxwell accent chair. Would look great in my library! WOW your living room looks so great now! We are building a house this year and will be needing some furniture - this would be huge help! I would select a sectional for our great room or a sleeper sofa as we are losing our guest room in the new house. I would definitely get the Rose sofa, possibly in same color you got! I love it! I would get the Rose couch and possibly same color you did---I love it! I love the Maxwell Accent Chair. I've been searching for something that looks this good, and is comfortable. It's good to have a tried opinion on the product! My neighbor just bought an Interior Define sofa and it is fabulous. I think I'd put the money towards the Caitlin sectional. Or the Rose; I love the arms on that one. I would love to add the Sloan sleeper sofa to our guest room! I would love the Ms. Chesterfield sofa! I'd love the Maxwell Fabric sofa. Your room is looking so comfy!!! Great job. I love the Rose sofa with right chaise! Looks so comfy! I love the Alice by Alison Chair in something velvet. Looks great! I think I'd go with the Maxwell sectional for our basement---looks like the perfect spot to cozy up with a movie with the family. The rose chair would look great in my sitting room! I would absolutely love the MAXWELL chair! It's gorgeous! I LOVE the Maxwell chair! It would look so fabulous in my living room! I would get the Rose chair. So pretty! I love the Sloan sofa! All of their pieces are lovely. I asked my 6 year-old son and we agree: the ROSE sofa is a winner! I would love the Rose sofa (with or without a chaise)! Ms. Chesterfield is my favorite! I would definitley get the Sloan sleeper. I'd be able to have a guest room again so my parents wouldn't have to deal with my in laws. I would love the Sloan Sleeper Sofa! I need so much furniture, it's hard to choose! But I think I'd go with the Maxwell chair for my craft room/play room. 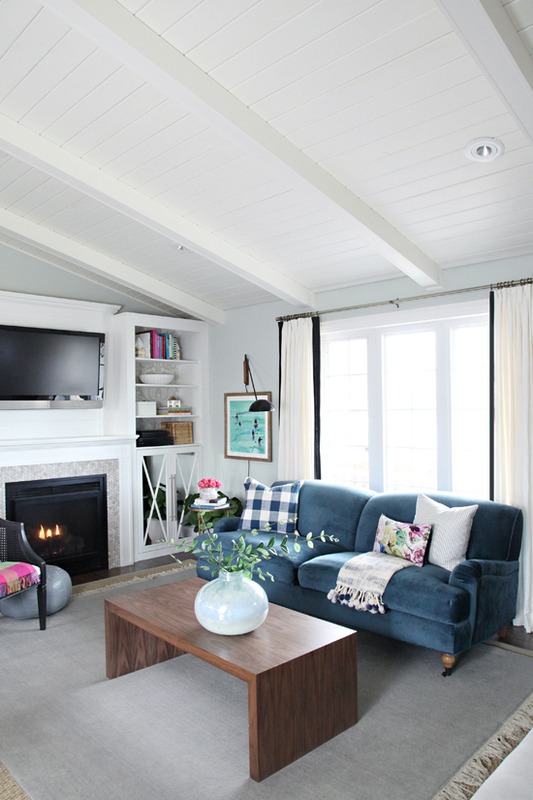 Your living room is so cozy and I love the eclectic, but cohesive look. I would love to have the Rose sofa in Elephant velvet to start our new living room. We are "right-sizing" after years in a larger space, and some new pieces will help to make the transition more fun and give us years of comfy reading and relaxing in a new place. I would love the Ainsley sectional for our living room! We're knocking down a wall to make it bigger and the sectional would be perfect for our larger space! I heart the Maxwell sectional! I love the Owens sofa! The Caitlin chair needs to be my new reading chair! We actually do need a new sofa! the Sloan sleeper sofa looks beautiful! I'd love the Rose chair! So cute! I love the Rosa couch, too! It would be the perfect replacement for my current couch, which has experienced some wear and tear! I love the Maxwell sofa! I have all the heart eyes for the Sloan L-shaped sectional!! I've been pining for it for *months* now! I love the look of the Ms Chesterfield! I recently just bought a new sofa but I would still love to win & let my son & daughter-in-law choose a piece. I would choose the Rose sofa in natural. It's lovely. The Rose accent chair in Citrine would be the perfect accent piece to brighten up our living room! The Ms. Chesterfield couch and Rose chair are lovely! The miles sleeper is gorgeous! The rose looks perfect for our space! Thanks for the opportunity and the resource! Beautiful new sofa! I love both the rose and ms chesterfield! The Harper sofa for our basement! Thank you for sharing! I would love to have a new chair for my living room. Your space looks gorgeous! I'd love a Rose chair for my bedroom!! Thank you for the contest! I would love the Sloan apartment sofa so that we could provide more hospitality. I would love the Rose sofa in sapphire or quartz. Oh man, I need a new sofa so bad! It's hard to choose which one is my favorite...I think the Caitlin, but I love the chesterfield too. The Ms. Chesterfield, hands down. So beautiful! We really need a new couch! I like the Maxwell, Rose or Chesterfield. I love the sofas, and really love the shape of the one you selected, the Rose. Your house is beautiful! I would select the Sloan Chaise most likely. Love the MS Chesterfield sofa and the Sloan leather chair...how to decide! I would choose the Sloan sofa bed! Your living room looks great! 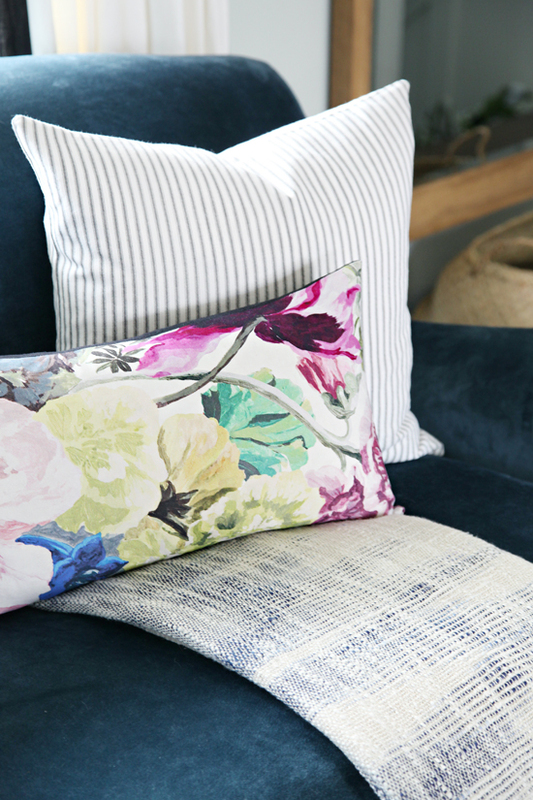 I love, love, love the Rose sofa! Have been looking for a new couch for many months!! Can you tell me what size you ended up with? The Rose sofa in that exact blue velvet !! The sloan sofa - especially since they offer apartment size and that's what we need in our tiny apartment! AINSLEY chair in navy blue! The Maxwell sofa! Love it! The Kelley chair would be fantastic in my living room. I love The Rose or The Caitlin chair! What a beautiful living room you have! The rose sofa with left chaise. In greige velvet. So pretty! Owens leather chair - so pretty! I love the Rose as well, but the Chesterfield also catches my eye. Love the Sapphire color you chose! We are actually in the process of redoing our living room and have been looking at new sofas. I would pick the Sloan....not sure on the color yet as there were so many choices. Thanks, Jennifer, for such a detailed review of your new couch and it's quality! Yes, it's super scary to order a couch online without sitting in it first, but you have given me confidence in this company. I am looking to replace our Gathering Room couches, so this article is timely! Our dog has loved on our sofa a little too much over the years that we have to put a sheet over it when company arrive. It would be wonderful to update that sofa! I love the maxwell sofa!!! I would love a Maxwell sofa to replace my husband's college sofa (sorry, honey)! With baby on the way this September we MAY be tempted to go with a sleeper sofa for future company we are sure to have living cross country from family! Owens would be my winner. We need a new sectional for our family room , maybe Sloan so many great choices! The Ms chesterfield in dark gray would be perfect!